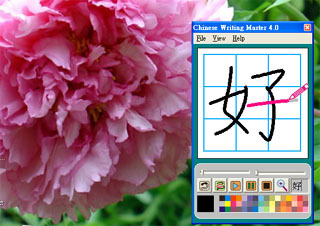 Chinese Writing Master 4.0 is a long-awaited dream tool for anyone wishing to learn and improve chinese characters handwriting. User Friendly Design Taking the advantage of non-chinese Windows. Built-in enhanced unicode support making it an ideal tool to learn handwriting simplified and traditional chinese characters. It explores the Windows built-in chinese functionalities. No external chinese system required. No chinese input skill required. Just copy a chinese character anywhere and see the results. 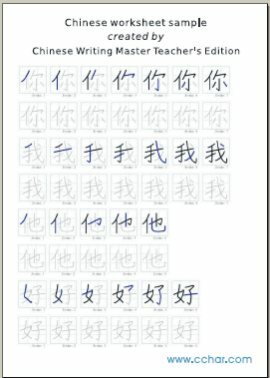 Dramatically flatten learning curve Step by step stroke order list, customizable animation controls, making it no reason not to learn well how to write chinese characters in an efficient and effective way. (1) Multilingual User Interface:Chinese Writing Master 4.0 can be easily translated to any language by modifying a single language text file(mylang.txt). 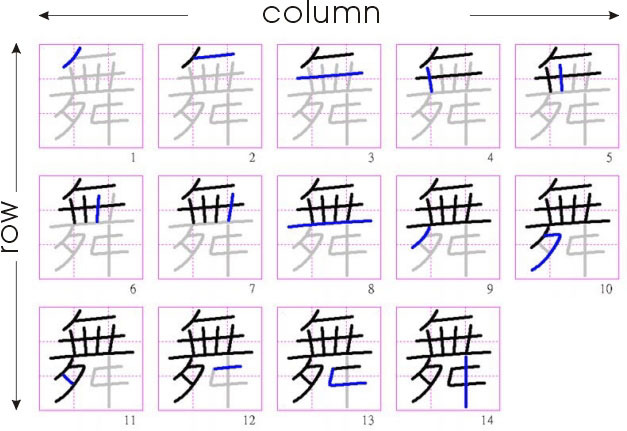 (2) Chinese characters library: Bundled with a simplified and traditional font library. 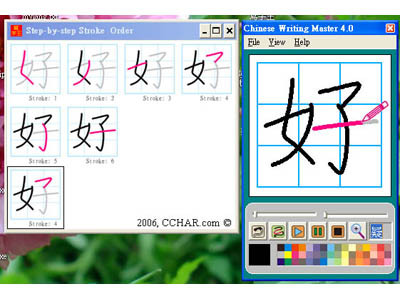 (3) Step by step stroke order with animation: A unique new feature of Chinese writing master 4.0. (4) User Friendly Design: For every chinese character, you can Play, Pause, Stop animated strokes by pressing a button. (5) No Chinese Input Method knowledge required: Just copy a chinese character, the software will auto detect and display that character. Note:You can highlight a chinese character and press 'Control-C' to copy. (6) User defined outline and color: You can select a line or curve of a character, and then change the shape of a chinese character by directly selecting and dragging a point. (7) Flashing stroke:You can make a particular stroke flashing (blinking) at a special color by using the flashing bar tool. (8) Alternate stroke color toggle:A character can have many strokes. Alternate stroke color making a character to replay on 2 alternating colors, so the users can see more clearly what current stroke is drawing. (9) Stroke outline toggle:An option to display a pale background of a character when replay. (10) Flexible Animation Timing: Users can control drawing speed of each stroke, and the time between 2 strokes. (11) Magnifier: A button let the users to magnify a character. (12) Encoding Support: Unicode, Big 5, GB. (1) Output to step by step stroke order pictures: You can save a series of stroke order to pictures. A unique feature to empower teachers to create customized teaching materials. (2) Output to GIF animation file: You can save the animation to .gif file format, making it easy to create Online Chinese learning and teaching materials. (3) Create customized chinese writing sheets for exercises: You can create different styles of praticizing sheets and output to pictures. Use any publishing or word processing software you like to print out the sheets. Revolutionary: Output chinese characters to GIF animation file. Create your own ONLINE chinese course. You can integrate with your existing educational materials, such as chinese audio files, to enrich your ONLINE content. Above: Animation Sample : Output to GIF file, empowering you to create UNIQUE educational ONLINE contents. Sample 1: Stroke order output. Sample 2: Stroke order output. Sample 3: Stroke order output. There are many options for you to output the above pictures. 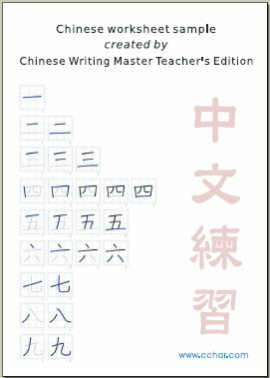 Just try out Chinese Writing Master 4.0 Teacher's Edition. You will admire the rich features it provides. The followings are samples of chinese worksheet created from Teacher's Edition. You can click on them and get a PDF file sample.